During the late 70’s and early 80’s one couldn’t go into a theater during the fall and winter seasons without seeing ads for the latest film adaptation of a Stephen King novel. One such film was released in 1983 and put together the filmmaker talents of “The Master” himself, John Carpenter with that of Stephen King’s unique brand of horror. This was the film adaptation of King’s horror novel about a boy and his car who he calls Christine. Christine begins with the titular car being made on the Plymouth assembly line and from the beginning we begin to see hints to the true nature of this 1958 Plymouth Fury. We’re soon introduced to the two leads of the film in the nerdy Arnie (played by Keith Gordon) and his more popular best friend and high school quarterback in Dennis (John Stockwell). It’s during their drive home from school that Arnie first catches a glimpse of a rusted-over and decrepit Christine in some old man’s backyard. Right from the start Arnie seems to have fallen head over heels for the old car and buys it without telling his over-protective and domineering parents. The film gradually shows the effect Christine has on Arnie as he begins to restore her to showroom status. As Christine becomes more and more restored Arnie’s personality begins to change from the shy, nerdy teen we saw in the beginning of the film to a more cocky and confident young man. This change in personality and look even goes as far as to allow Arnie to land the prettiest and most wanted girl in school (Alexandra Paul playing the role of Leigh). But like all tales about a boy and his car things never seem perfect as they would seem. Bullies at school who decide to retaliate against Arnie for him standing up to them becomes the main catalyst which would unleash Christine’s full fury. Christine the film deviates much from the Stephen King novel, but still keeps enough of the basic themes from the book that fans weren’t screaming for Carpenter’s head the way they did for Kubrick’s after Shining came out in the theater. Where King’s novel explored the topic of objects inheriting the evil done by their owners to the point that they become sentient and corrupted by it in the film it’s more of a young man’s soul warred over by his first true love and those who truly care for his well-being. In one corner we have his true love in Christine the 1958 Plymouth Fury and in the other his best friend Dennis and his girlfriend Leigh. Carpenter does a great job of conveying the idea that this car was a living and breathing thing. A thing who was as obsessed about Arnie as Arnie was about it that it would kill anyone who got in its way. The film did modestly well when it came out in 1983, but it has since gained a cult following from both Carpenter fans and those fans of Stephen King’s original novel. 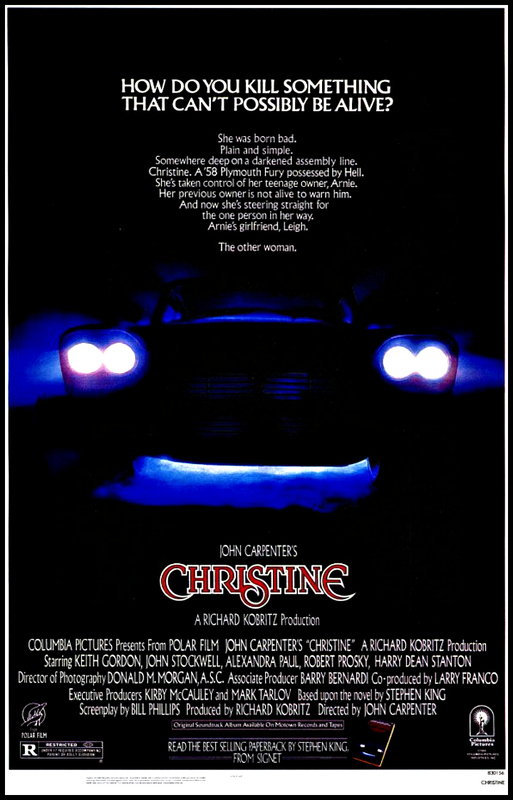 Christine was one of Carpenter’s more studio-like film, but even here he was able to bring his grindhouse sensibilities to the project. If there was ever a film where the idea of a young man falling in love with his car like it was the perfect woman then Carpenter’s Christine definitely fits the bill. This entry was posted in Film, Film Review and tagged Alexandra Paul, Christine, Christine Belford, Columbia Pictures, David Spielberg, Harry Dean Stanton, Horror, John Carpenter, John Stockwell, Keith Gordon, Kelly Preston, Malcolm Danare, Robert Prosky, Roberts Blossom, Stephen King, Steven Tash, Stuart Charno, William Ostrander. Bookmark the permalink.